This painting of Jesus was done in Szczecin, Poland. It has a peacefulness that comes forth. It can transmit this peace to anyone who wants it. Framed with a handsome brown oak floating frame; 18 inches x 22 inches inclusive of the frame. Ready to hang. 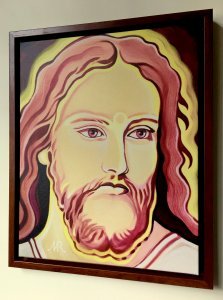 Painting the Christ through studying A Course in Miracles with Tara Singh. 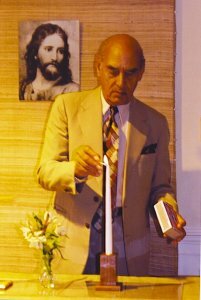 I studied A Course in Miracles for over 30 years. Seventeen of those were aided by the tutelage of Tara Singh. He had a deep insight into this modern day psycho/spiritual scripture, and he could bring people to a state of mind to experience the absolute within themselves, which is ACIM’s purpose. 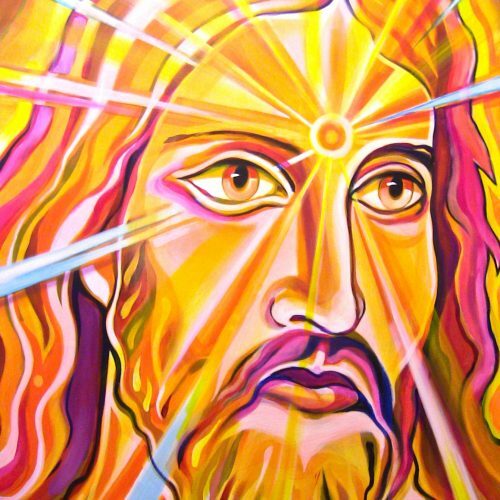 ACIM is Jesus, the Christ, speaking to us directly of the absolute. It is the absolute truth in contemporary terms. In fact, it will always be contemporary, because its Voice is always in the present. Tara Singh was always in the present, as is the Voice of the Course, which is that of Jesus. At Tara Singh’s Foundation in Los Angeles, and at some of the retreats he conducted, there was a Prayer Room. It consisted of an Altar, and pictures of Holy Beings hung on the walls in the room. The Altar was lit with candles. The walls were lit with pictures of Holy Beings. One of these was Jesus, of course, to honor the Voice of A Course in Miracles. Somewhere in the beginning of my seventeen years with Tara Singh, I knew he was my life teacher. What came out of his mouth awakened me to the truth of my own being. 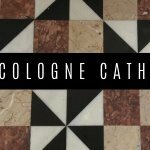 What he said reinforced the truth of what was said by Jesus in ACIM. Without Tara Singh’s insight into this truth, I may have missed the whole point of ACIM altogether. He woke me up for sure. This is what a real teacher does. He dispels the darkness inside of a person and ignites the light in him. He does this because this is his function in life to do—to wake people up out of their deep sleep. When I began painting Jesus myself, I used Hofmann’s Jesus as a model. 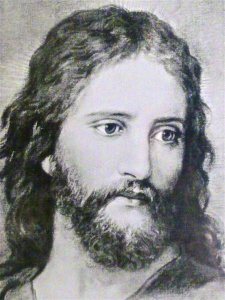 I would paint Him in my own style, and somehow invoke the presence of the Christ to enter my paintings. It was an action of inspiration. 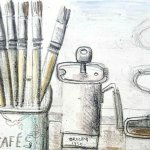 I felt the presence when I would paint. People felt the presence seeing me paint. Some people would buy the painting to have that presence in their home. I painted Jesus all over the world, like I also painted Babaji and the Divine Mother. These three became the main focus of my subject matter. They were enough for me. I never got tired of painting them. They always gave new expression to each painting, which was unique. It never felt “repetitious.” These three Holy Beings we began calling the “Dream Team.” This giclee below of the Dream Team you can purchase here. The Babaji on the left I painted in Northern Italy in the Italian Alps. 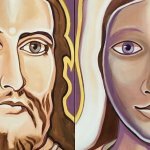 The middle Jesus I painted in Belo Horizonte, Brazil; and the Divine Mother on the right was one of my first I painted in Valencia, Spain. I put them together in this giclee, which is 16 inches x 40 inches. We have one of these “Dream Team” giclees over our front door. I feel They protect our apartment from any unwanted energies entering. So far, I have seen no goblins in our apartment, so They must be doing Their job. 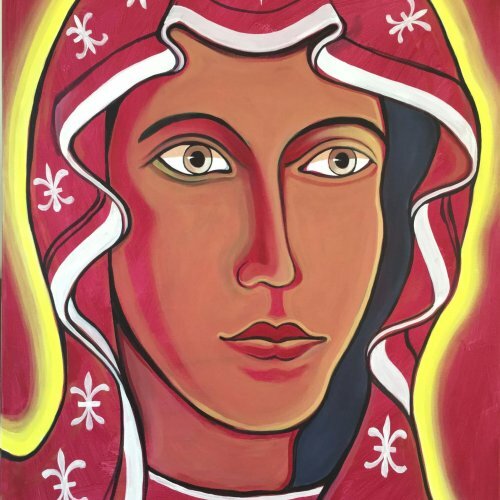 Christ of Poland has more feminine eyes. He was painted in Szczecin, Poland, in the home of Krzysztof and Aga. I used a very simple palette. Only a few colors. Red hair. I painted Him on a piece of primed linen. Somehow I got it just right, and the gentleness came through. Because I painted Him on an un-stretched surface, I could roll Him up and take Him with me to Denmark where Anka Lalatovic purchased Him. 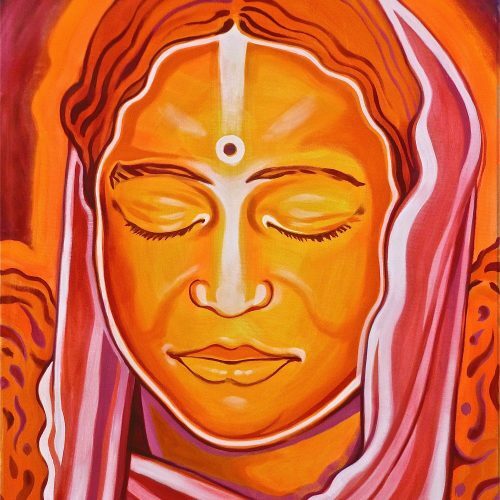 She had bought a diptych of Babaji and the Divine Mother a few years ago. So naturally I was very pleased that she should have Him. I always say, “The paintings know where they want to go.” And without fail, they sell themselves miraculously. 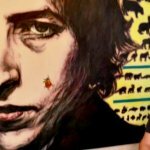 The reason I paint Jesus is to connect with Him. While painting, with Him in mind, there is a peace that comes over me. 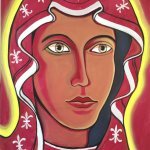 I have to be very present with the painting and very aware of the Christ Presence. The more aware I am, the better the painting goes, with more power to transmit the presence. I try to drop everything in my mind and just focus on the painting itself. No other conditions come into play. Another reason I paint Jesus is to help others connect with Him. This was the purpose of the Icon Paintings in ancient times, and it is my purpose as well. When the painting is “in the groove,” and I feel like I have done my job well, the presence gets stronger and stronger when you look at it. This Christ of Poland does just that for me. I never grow tired looking at it. It is always fresh and new. The best reason for painting Jesus is I feel I am putting Him out there in a different way. 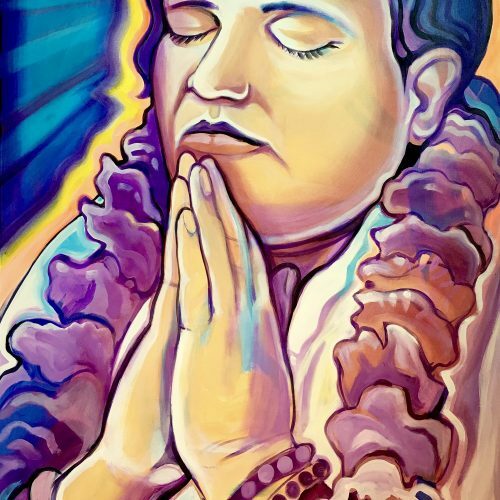 As I know Him through A Course in Miracles, it is a way I can honor those years of study with my teacher of A Course in Miracles, Tara Singh, to whom I am eternally grateful. 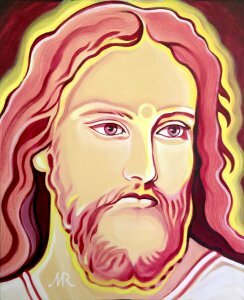 You can purchase this painting, Christ of Poland, as a giclee (printed on canvas) and framed with a simple floating brown oak frame. (18 inches X 22 inches, inclusive of frame) I am offering two of them for sale, each for $100 off list price of $750 for the rest of JULY. For USA, price includes crating and shipping. For countries outside the USA, send inquiries to contact@markusray.com so we can give you a shipping cost.